From Path Architecture: "Bridge as a connector, a center of commerce, and an icon worthy of representing the city of portland to the world. A glass enclosed, auto-free street with dedicated lanes for pedestrians, bikes, and trains, with over 100,000 square feet of bustling commerce. 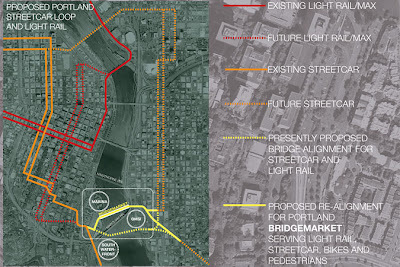 A city-level commerce and transportation bridge that creates a seamless connection between east and west Portland." Portland Spaces mentions some of the details and challenges: "Of course, pulling this off will be challenging. For one, the proposed site near Riverplace is located outside of the city’s retail core. 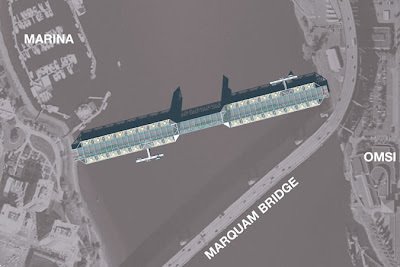 Second, adding office and retail space would certainly add cost to the bridge, whose funding will be sourced from a variety of streams, including federal transportation funds... Still, the addition of 100,000 square feet (that’s 2.5 Portland city blocks) of commercial space could also create revenue and enliven the waterfront like never before." 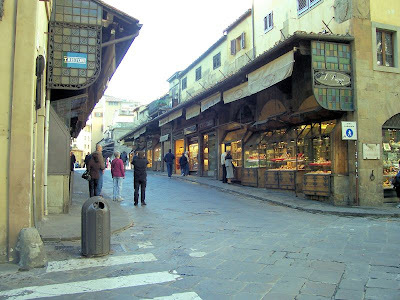 Also mentioned in the coverage is the allusion to other bridges for commerce, particularly the Ponte Vecchio in Florence. 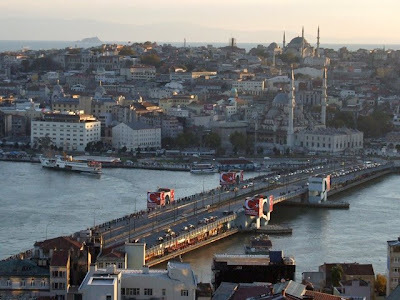 Another example I've never heard of, mentioned in the comment stream, was the Galata Köprüsü bridge in Istanbul. 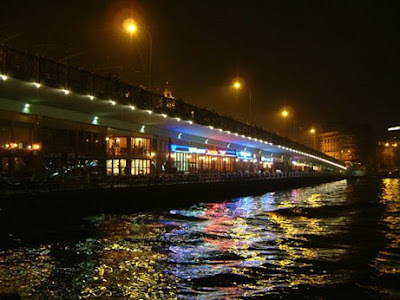 From commenter Rob: "The river deck of Galata primarily cafes and restaurants on the lower level, which is where pedestrians walk, below traffic level and pretty much at water level. It’s a cool spot in Istanbul summer. Popular for fishing too." 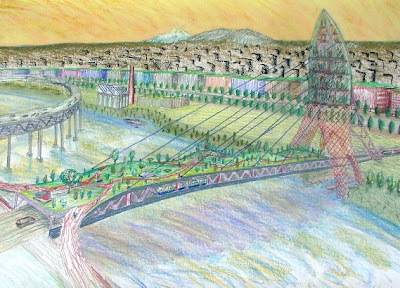 This idea of dual purpose bridges is powerful, especially in a city where bridges make up a good portion of the identity of the space. This reminds me of the ill-fated Interstate 405 capping project from the 1990's, which attempted to expand urban space and remove some of the severed downtown connection from the depressed interstate corridor. As a native who has moved around the country and abroad , I am always astonished when I return home to see how many neighborhoods have been revamped and flourished ,how many new people have moved to Portland ,new shops,new places to eat etc , but I often wonder how certain ventures such as this can really flourish unless marketed to people who would potentially relocate to Portland. The Waterfront and Downtown have always experienced problems with these types of commercial ventures and maybe with the mind boggling population growth ,perhaps it will change. What I do know to be true of Portland is that commerce flourishes best in an already established neighborhood,as Portland ( and other towns in Oregon) are so neighborhood oriented. Even though it is growing ,for better or worse , the neighborhood feel is what people like about Portland ,and natives are general not too warm toward large expansive structures in which one must drive to . I know plans for this area have been in planning for many years now , it will be ineteresting to see if any of it will actually succeed,and again , i think this type of market is going have more appeal to those who will relocate , as opposed to locals who favor a more down home asthetic and lifestyle. Very true. It seems for all of our planning and design of large(r)-scale economic developments, the true community comes from within and develops organically. Look at Alberta, Mississippi, 28th & Burnside - to name a few - neighborhoods which were developed by multiple parties in aggregation. The Pearl Distric seems to have reached a critical mass (although not necessarily a Portland style and social class). The South Waterfront is definitely going to take a long time to develop anything resembling a cohesive neighborhood - or an economically viable area. And true, most of the energy is coming from outside, not from within - kind of the anti-Portland. The idea of Portland is one of great fabric and planning - and so-so architecture that knits it together. Most of the large-scale plans have taken time to develop... the Burnside Bridgehead, Cascade Station, and the aforementioned Pearl and SoWa... while the next areas of neighborhoods continue to thrive organically, from within. Thus with the larger visions, the essence of Portland will still be the pockets of neighborhood commercial that is in proximity to affordable housing, transit, and the things that make Portland, well, Portland.